Premier Andrew Fahie said that the 2019 budget, which he detailed at the House of Assembly on Tuesday, mainly reflects the past administration’s efforts but that his government was able to make some changes. The total budget is $426,112,972, which includes $331,742,666 on recurrent expenditures; $73,123,856 on capital projects; $7,837,060 in fund contributions; and $13,119,400 towards principal repayments on debts. “We would have liked to have seen a greater investment on the capital side, but we accept that the 2019 budget is indeed a transitional budget,” the premier said. He added that the budget does not include money that has to be paid out to companies and individuals who sued the previous administration in the past seven years. The government collected $327.3 million last year, $61.3 million more than it projected, although it is not clear where the additional revenue came from. Meanwhile, recurrent and capital expenditures were both below budget by approximately $16 million and $20.4 million, respectively. 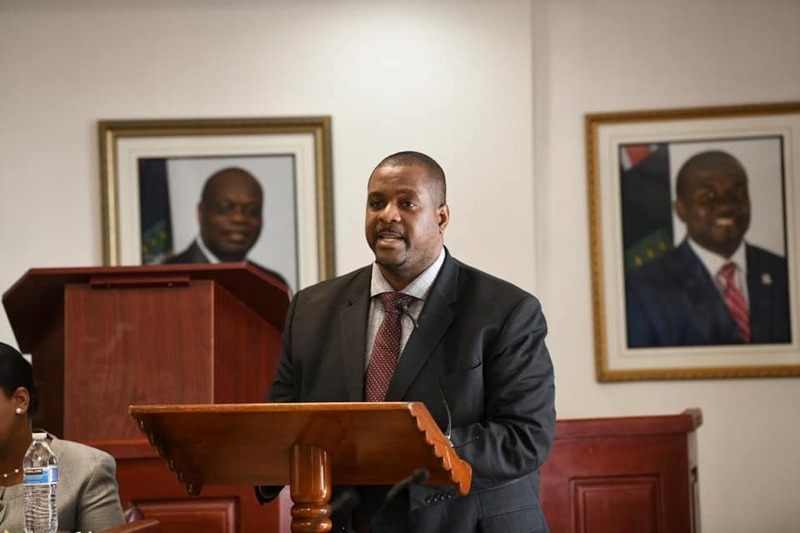 “It is important to note that, despite the fact that our children had to endure continuing shift system at secondary schools, sewerage running through our streets, and continuing water woes,” Mr. Fahie said. He added that the previous administration “failed to take care of the major capital projects last year” like the Pockwood Pond incinerator, the Cox Heath dump site, the West End ferry terminal, and the Multipurpose Sports Centre. Part of the 2018 budgetary surplus, he explained, was spent on debt repayment, including $10.7 million spent to pay down a line of credit with FirstCaribbean International Bank. The central government’s principal repayments totalled $24.6 million and loan disbursements totalled $53.9 million, he said. The loan disbursements included a full drawdown of the $50 million policy-based loan from the Caribbean Development Bank. The payments in public debt translated to an approximately $30 million increase in the central government’s total level of debt in 2018, according to the address. At the end of 2018, the total central government debt was $151.8 million — approximately 12.5 percent of nominal gross domestic product, he said. The bulk of the 2019 budget will go towards health and education, as it has in past years, the premier said. Twenty point nine percent of the recurrent budget allocation will go to the Ministry of Health and Social Development and 15.4 percent will go to the Ministry of Education, Culture, Youth Affairs, Fisheries and Agriculture. Out of the $73.4 million estimated development expenditures, 16.2 percent will be “allocated to, but not limited to,” the restoration of the L-shaped building at the Elmore Stoutt High School and the construction of temporary classrooms, as well as the restoration of various basketball courts and the Bregado Flax Secondary School, the premier explained. Ten point two percent of the development vote will be allocated to various capital initiatives in the HSD Ministry, including the ongoing work at the Nurse Iris O’Neal Clinic on Virgin Gorda. Fourteen point six percent of the recurrent budget allocation will go to the Ministry of Transportation, Works and Utilities, 13.4 percent to the Ministry of Finance, 11.5 percent to the Governor’s Group, 10 percent to the Premier’s Office, 8.7 percent to pensions, public debt and funds contributions, 2.7 percent to the Ministry of Natural Resources, Labour and Immigration, and 2.7 percent to constitutionally established departments. The NRLI Ministry is allocated 4.4 percent of the development vote to restore national park structures like the J.R. O’Neal Botanic Gardens; to rehabilitate other visitor centres; and to remove and dispose of derelict vehicles and vessels in preparation for hurricane season. The premier listed various figures showing the ongoing restoration of the tourism industry, while also setting goals to boost the recovery, like courting local and international investors in order to ensure that there are 5,000 beds available in five years. Cruise arrivals in December 2018 were 80 percent of arrivals in December 2016, while overnight arrivals in December 2018 reached 70 percent of arrivals in December 2016. Additionally, the premier highlighted the defence and promotion of the financial services sector, an industry that made up 62 percent, or $232 million, of government revenue in 2018. The premier mentioned several plans to strengthen public sector financial management, which included a Public Procurement Act to improve transparency and objectivity in the government’s procurement process by establishing standards for documentation and an appeals process. He said a draft bill of the act is “in its advanced stages” and will be brought to the House shortly. Mr. Fahie also said he plans to amend the Public Finance Management Act and to mandate reporting of financial data from statutory bodies and state-owned enterprises. The premier concluded by listing several additional expenditures and said the administration “was able to massage the estimates at this late hour” to include them. These included the payment of two years of increments to public officers, as well as funds to assist public officers with repairing hurricane damage to their homes. He said the government will also incentivise private businesses to hire VI youths by paying 10 percent of their salary for the first year, allocate funds to assist residents struggling with unemployment, and train young people in the marine sector.